How to re-ignite a startup culture. 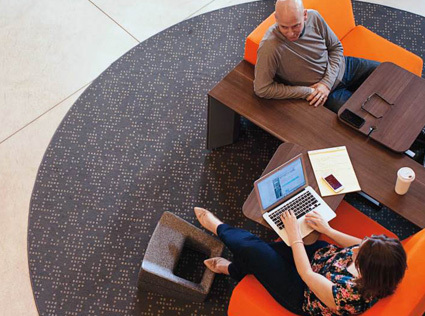 In the new Steelcase 360 Magazine entitled “Think Better” there’s an article called, “Igniting a Sense of Start-up Culture”. We all understand that startups have an authenticity that is built from determination, passion and ingenuity – the struggle to make something out of nothing. But what if a more “mature” company wants to incite some of these characteristics in their culture. Can it be done? In exploring this question three tips emerged that might help entrepreneurs, people in real estate, space creators in larger organizations, facilities managers, incubators and disruptive thinkers to ignite—or reclaim—a sense of “startup culture” in the workplace. Push the envelope with materiality and choose progressive finishes to create an energetic vibe or a warm, residential feel with commercial-grade quality. Embrace a DIY spirit by adding unique statement pieces into your space that reflect your inner-artist and put your passions on display. Support the intrapreneurs in your ecosystem by giving them a space devoted to unleashed creativity and true freedom to innovate. If possible, physically move intrapreneurs away to help activate a new sense of startup culture. Champion their disruptions as vehicles that will move you toward a stronger, more relevant company. Add lounge spaces and standing-height elements to to complement ergonomic seating. Send the message that you trust and support your team to choose the places and postures that best encourage productivity and focus for them. Intentionally design other spaces that promote quiet, collaboration and fun, so that people can truly love the way they work. 12 Great reads on "thinking better"